All the bees are dead and I want to know why. I want to autopsy the bees. Technically, since they are not human beings, I want to dissect the bees. But Mr. Beekeeper husband is feeling really sad about these bees. He feels like he failed to take care of his girls. We, therefore, are treating his loss with all due respect. Autopsies are in order. I personally can’t wait to dissect…I mean, autopsy…the bees. It takes me back to the dissection unit of my 10th grade biology class. I had really squeamish lab partners, so I ended up pretty good at dissecting by the end of the unit. By the time we got to the pithed frog I felt like I was doing surgery. It was cool, even though the frog died. John doesn’t quite share my enthusiasm. While I set up my equipment, he gets out the build-your-own-volcano kit that Harper got for Christmas. And he and Harper later go feed a pinkie mouse to the snake. That apparently is more interestsing than cutting open honeybees. Nevertheless, John brings a frame containing dead bees up from the basement. 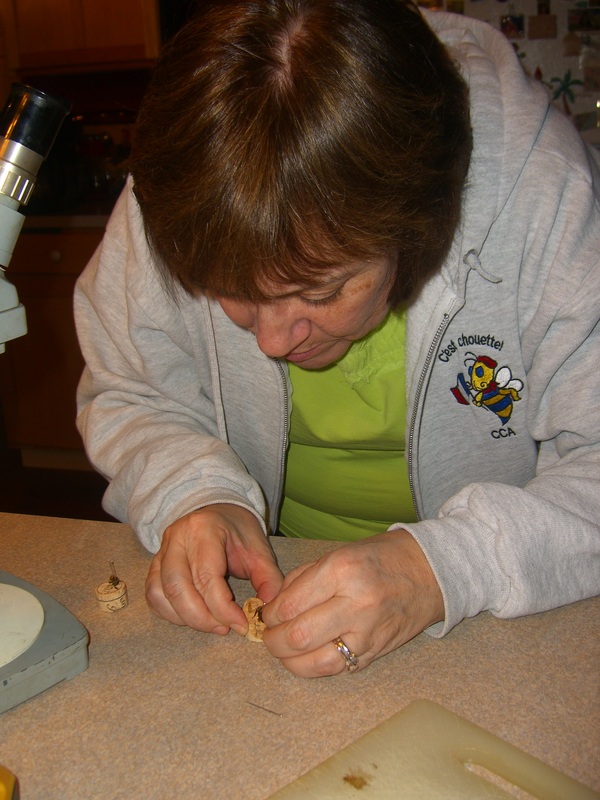 Now it is time to actually dissect the bee. Umm…what am I supposed to do exactly? It was Richard Jones & Sharon Sweeney-Lynch’s The Beekeeper’s Bible (Stewart, Tabori & Chang, 2011) that put this idea in my head in the first place. 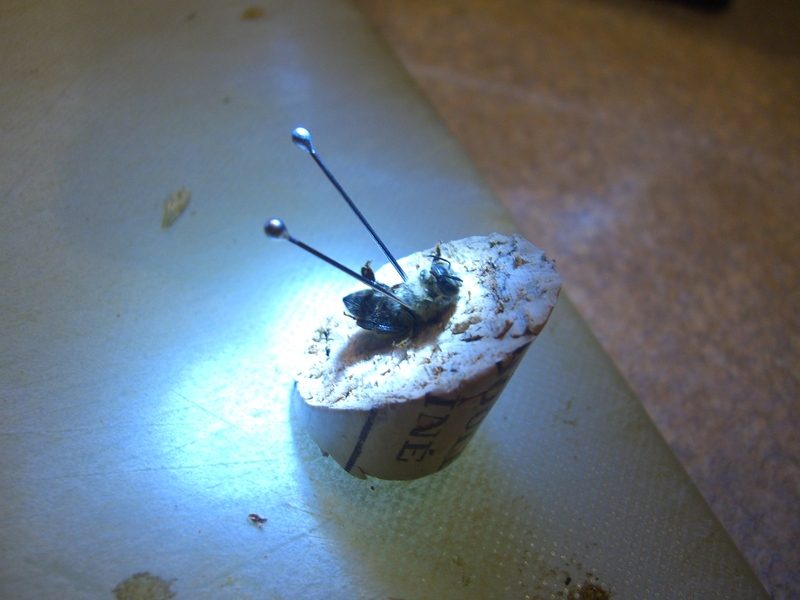 It tells me to pin the bee onto the cork at an angle for better viewing and then cut off the bee’s head and thoracic collar. 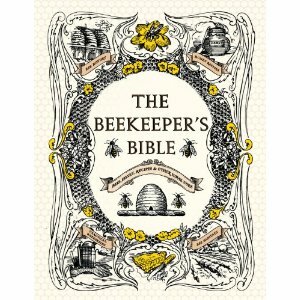 This requires a little more research because The Beekeeper’s Bible does not provide me with critical information, like how the heck one finds the thoracic collar of a bee. This technique can also be used for interrogating the bees. The flashlight is particularly effective. Oh, the cork is cut at an angle. 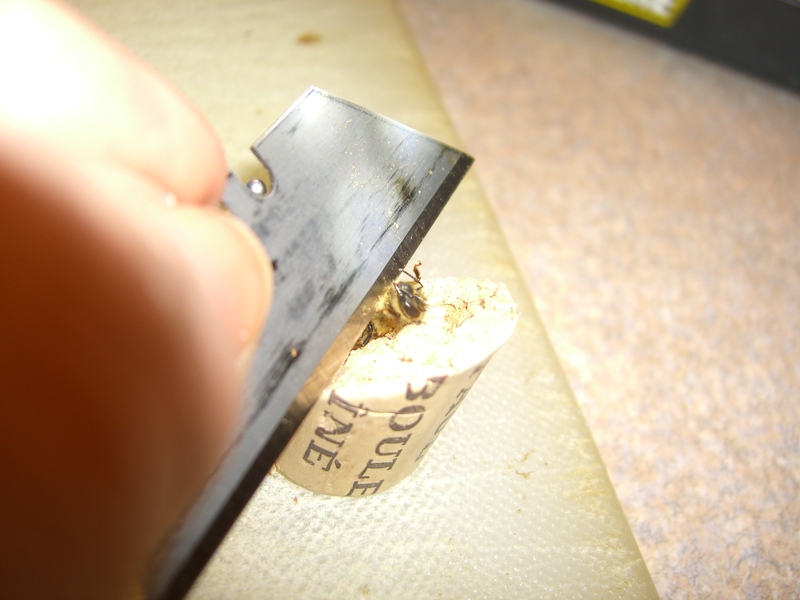 The bee is pinned to the cork. The cut is made between the first and second sets of legs. The thoracic collar, which is to be pealed off with tweezers, is nicely highlighted in red. This is where French teaching and beekeeping intersect–the guillotine. Minor problem. The thoracic collars of my bees are not highlighted in red. 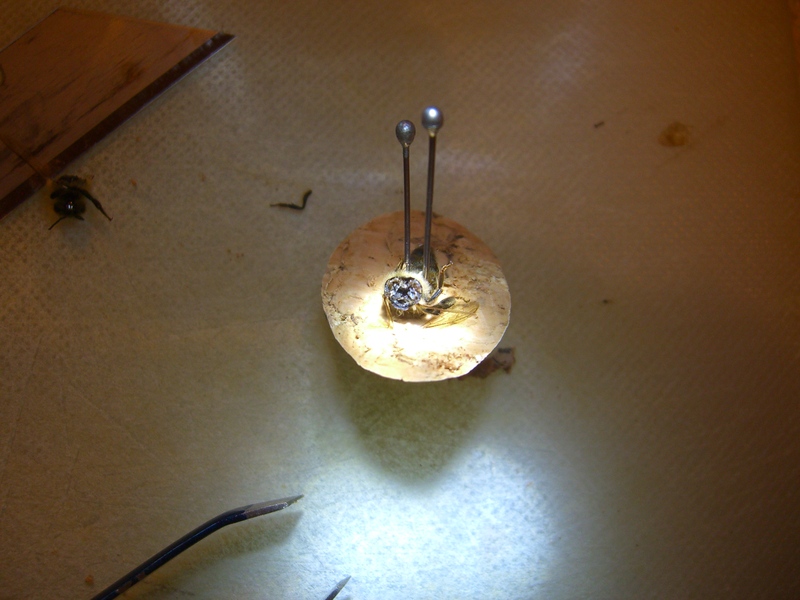 And, second minor problem, the tweezers are not official dissecting forceps and are a little clumsy to work with. So, even if I think I know where the thoracic collar is, trying to remove it to get a better look at trachea pretty much rips the bee apart. Not that I have any lack of bees to experiment with. I decide, for the sake of my own sanity, to forego the removal of the thoracic collar and just see what I can see. I really have no idea what I’m showing you here. Here I actually see video images of what healthy bee insides look like. Our bees don’t look anything Dr. Ellis’ bees. I’m thinking maybe our bees have been dead just a little too long. Either the autopsies are strongly conclusive of mite destruction or they are completely inconclusive of anything. I lean toward the latter. 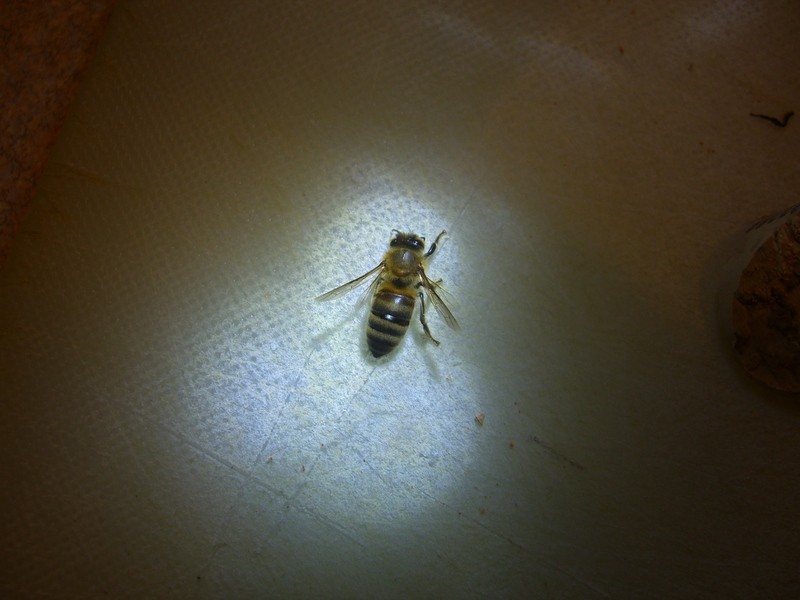 Do stale bee bodies mean the end of our investigation? Not at all. The presentation of bees in the hive tells us something. The bees are not as clumped together as we would have expected. That could be symptomatic of erratic behavior induced by tracheal mites. More importantly, we think back to the behaviors of the hives since last spring. Hive D never did get off to a good start. It never thrived and was the first hive to die in the fall. John had thought that it was a problem with weak queens and so he requeened some of the hives. He didn’t realize that the weakness of the hive in the spring could also have been due to tracheal mites. Requeening was not a bad idea. However, according to Dr. Ellis’ report, it would have been more successful with queens who were resistant to tracheal mites. This supports our current thinking of buying Minnesota Hygienics in the spring. Do these wings look weird to you? There is one really obvious symptom of tracheal mites that we have observed but were clueless as to its significance: bees walking around the beeyard. More specifically, bees with odd wings walking around the beeyard. Bees don’t walk places. They fly. 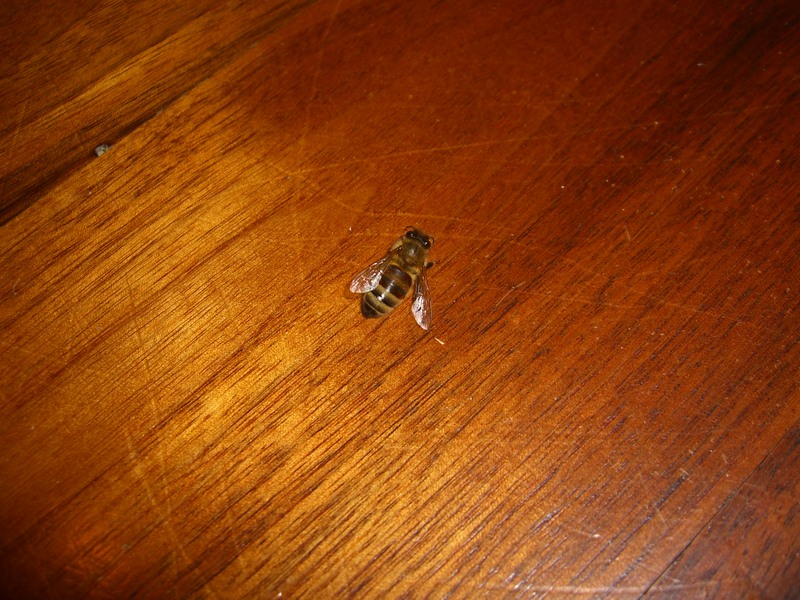 Walking bees, particularly if they walk up a blade of grass and are unable to take off in flight, are not normal. We found this phenomenon fascinating. In hindsight, those are the bees I should have been dissecting. 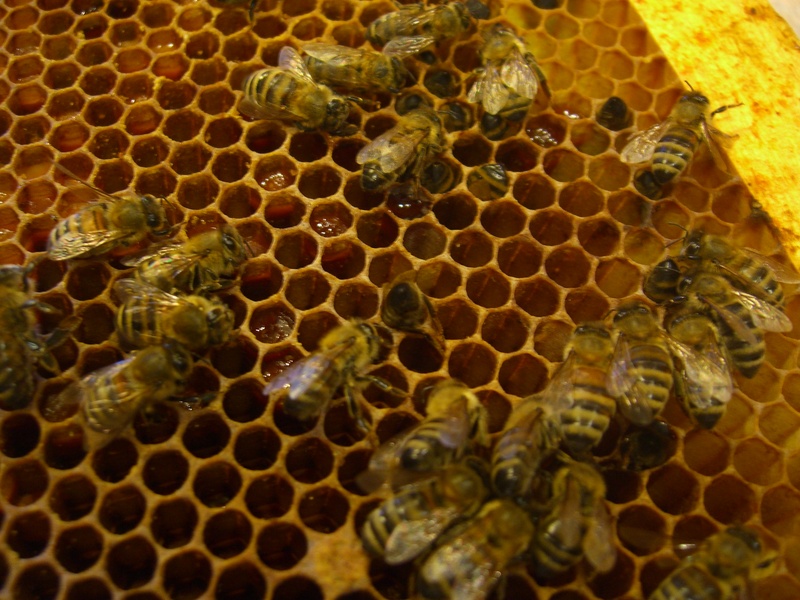 Those were the bees afflicted with tracheal mites. Instead, we watched doomed bees wander around on the ground while we sipped chardonnay and beer, oblivious to the knowledge that the doomed bees’ sisters were infected as well. Oh, how callous we were! Oh, how expensive a lesson we learned. We’re like detectives who went out for a drink with the prime suspect and let him get away. And now there are bee bodies everywhere. Really. John dropped a few coming and going to the basement. He thinks he picked them all up, but he didn’t. The evidence speaks for itself. The aroma of freshly grated ginger, minced sage and garlic has my mouth watering for the sausage that John is preparing. The man-cave, where John works his culinary magic while watching Rise of the Planet of the Apes, smells amazing. This is serious aroma therapy. This can waft through the house any time. As for the apes, well, that is what a man-cave is for. And they usually waft in after a few hours hunting from a deer stand. “The organ donors are here!” With that pronouncement, a hunter hands me a plastic bag containing a fresh deer heart and liver. Delighted with the gift, I immediately put it into the man-cave fridge. The hunters used to toss out the heart and liver, but now that John is into charcuterie, the organ meat is a special treat. 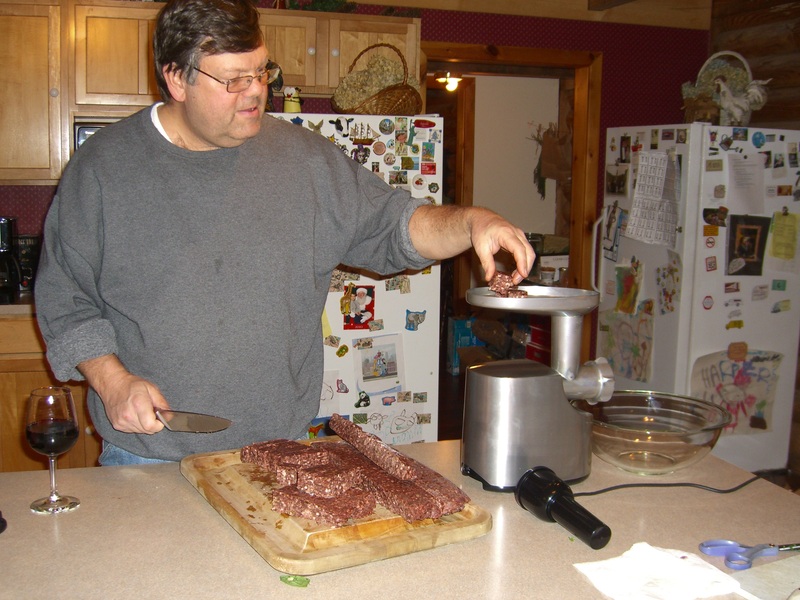 John launched his interest in charcuterie with his (in)famous venison liverwurst. 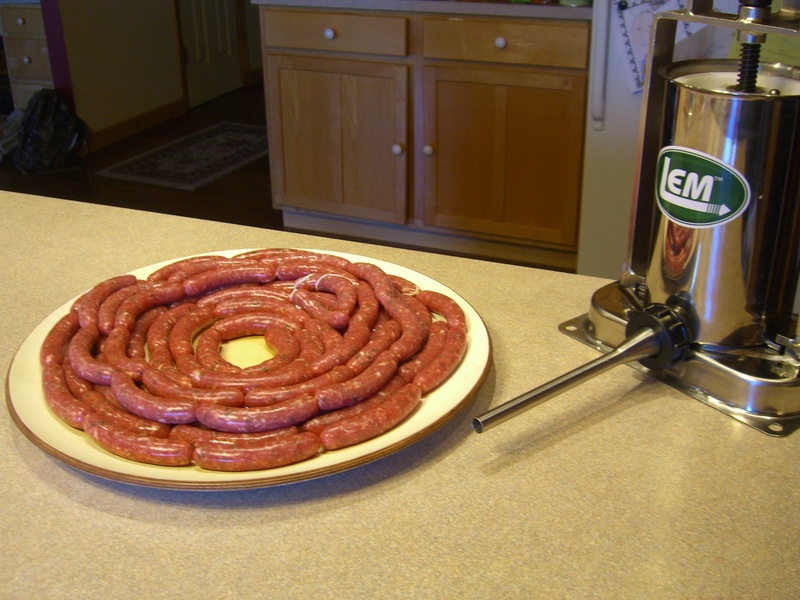 Then he wowed us with his pepperoni-like jalapeno venison sausage. Now he masters non-venison sausage. 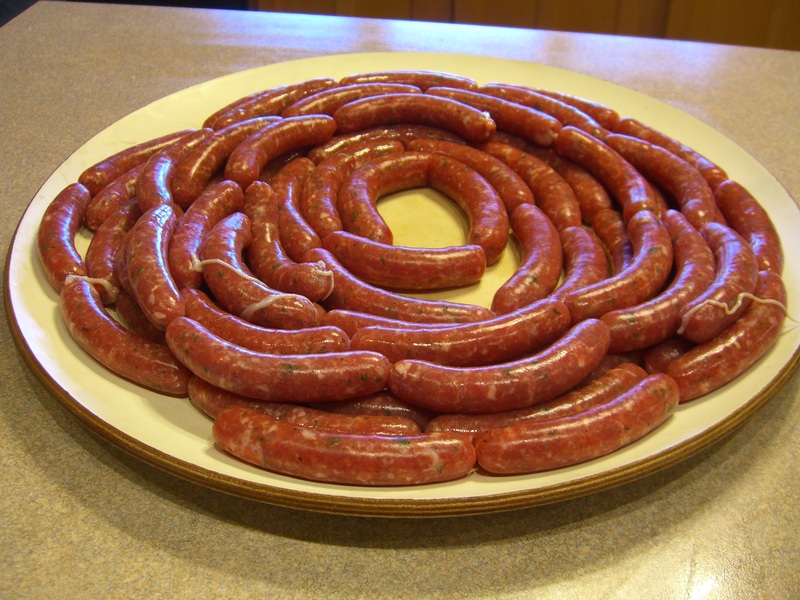 Last week we had turkey-dried cherry sausage. It was amazing for dinner with some roasted potatoes and sautéed brussel sprouts. With the success of the ginger-sage pork sausage, we are now hooked on these little breakfast links. I’ll use them in the Thanksgiving Day stuffing. They will be featured at the Christmas morning brunch menu. What’s left from this batch will be gobbled up by Harper for breakfasts. My husband can spend time on the links whenever he wants. Sausage links, that is. (He doesn’t play golf–ever.) He’s gotten really quite good at making sausage and we really enjoy the quality and taste of his homemade charcuterie. However, like anyone addicted to links, his hobby requires the necessary toys… I mean, equipment. Heavy duty Waring Pro meat grinder–no plastic parts on this baby. First he needed a meat grinder. A good one. So he got one for Christmas. 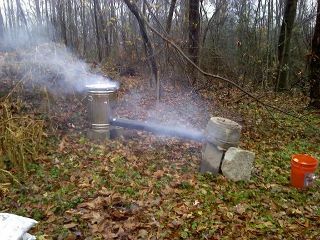 Then he needed a smoker. Well, those are a bit pricey, so he made his own with a few inexpensive items bought at Home Depot. Yeah, it’s pretty red-necky but I think that’s part of the charm. Plus, it works. The meat grinder came with a sausage attachment, but it was annoying to use. So…next came a sausage stuffer. And then an attachment for doing the breakfast links. Now he’s talking about converting a fridge into a humidifier to replicate cool Italian caves for making dry-cured sausages. You see where this is going. Oh, he’ll get his fridge, but I’m insisting that it be the old fridge and that I get a new one for the kitchen. 1. There is such a thing as too much fat in sausage. 2. Not everything tastes better smoked. This was a hard lesson to learn. Ten pounds of meat went into a smoked liverwurst that was so bad we didn’t even offer it to my sister’s dog. To make the loss even worse, John stood over the smoker in the rain protecting it with an umbrella to finish it. He not only couldn’t eat it, he got cold and wet in the process. 3. A good cookbook is invaluable. 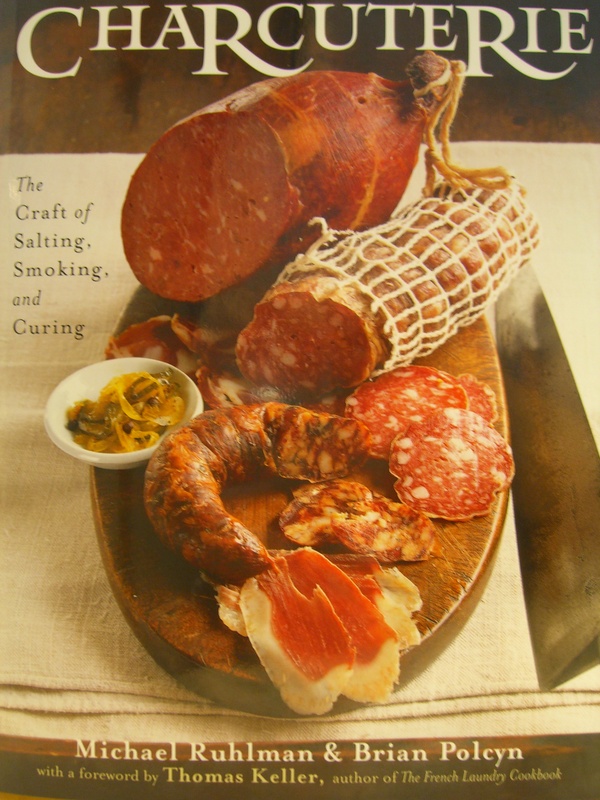 Recipes for Breakfast Sausage with Fresh Ginger and Sage, Turkey Sausage with Dried Tart Cherries, and Summer Sausage all came from Charcuterie: The Craft of Salting, Smoking, and Curing by Michael Ruhlman and Brian Polcyn (W.W. Norton, 2005). The book gives excellent instructions on the basics of sausage making and the recipes produce delicious sausages you just can’t buy, as well as sauces and relishes and such to go with them. If you come over one day and find a new fridge in my kitchen, you’ll know John has gotten his “Italian cave.” But it will be a win-win-win situation–I’ll have a new fridge, John will have a new “toy” and there will be more sausage curing in the man-cave for us all to eat. It’s mid-summer and my dilemma du jour is this–which book to read next? Before heading off on vacation last week, I spent hours browsing and uploading books (or at least samples of books) onto my Nook. I didn’t really need to do that since our beach place had internet as well as books, but it’s part of my packing ritual. I need to head for the beach with a supply of books that will last me the week. The ritual used to involve shoving a big bag of books into the trunk of the car, or for lack of space, sometimes under my feet on the passenger side, which meant that I rode to the beach in a fetal position. The bag of books was then fair game for anyone to read. There was some reading strategy involved with sharing a bag of books. Fast readers would not want to finish one book to discover that a slow reader had just grabbed the book they wanted next. It’s torture to watch a slow reader go through a book two pages at a time, with breaks for yapping or napping or dips in the ocean. They should read the dang book or hand it over to someone else. With the Nook, I no longer pack a bag of books. I just load up the device. The advantage is a library in the palm of my hand (and space for my feet in the car). The disadvantage is that John has nothing to read. If someone wants to read my Nookbooks, he has to (1) own a Nook and (2) be my “Friend.” My mother is my “Friend.” And she owns a Nook. * My husband John is my friend, but not my “Friend.” And he has to share my Nook, which I am usually reading. So John loses out here, except for the fact that the beach place has boxes of real books in every room. One thing I really, really love about my Nook, is that I can read in bed with the lights out. In the summer, this means that I stay awake reading into ridiculous hours of the morning and then am dead to the world for the best gardening hours of the day. I’ve been teaching longer than any of my high school students have been alive, but I confess that I revert to teenage sleep habits in the summer. All it takes is one captivating book, and my schedule is shot for the summer. This year it was The Hunger Games trilogy, most of which I borrowed from my son-in-law, who is my “Friend.” One night last week I got so caught up in Laura Moriority’s What Alice Forgot that I read chapter after chapter until the battery conked out at 3 a.m. If I had been at home, that would not have stopped me, since the charger is right by my bed, but the outlet was on the other side of the room so I took the lack of juice as a sign to call it a night. The next day on the beach I finished the book, with happy salty tears dripping down my already salty face. Some people claim that one cannot read a Nook at the beach. Kindles are apparently better in sunlight. Actually, I can read the Nook at the beach. I set the screen brightness all the way up, sit under the umbrella for shade, and wear a baseball cap to provide more screening for my eyes. I can’t see the screen with my super-duper prescription sunglasses, just like I can’t read the clock in my car with them on . I could get some cheapie sunglasses, but the hat and umbrella work. My “Friend” Mom chose to read real books on the beach and her Nook at bedtime. I read whatever I had my hands on at the time, book or Nook. ( My Nookbook What Alice Forgot was followed by Jodi Picoult’s House Rules, which I found in a box at our beach rental.) Truth be told, a real book is best on the beach. It’s a tactile thing. 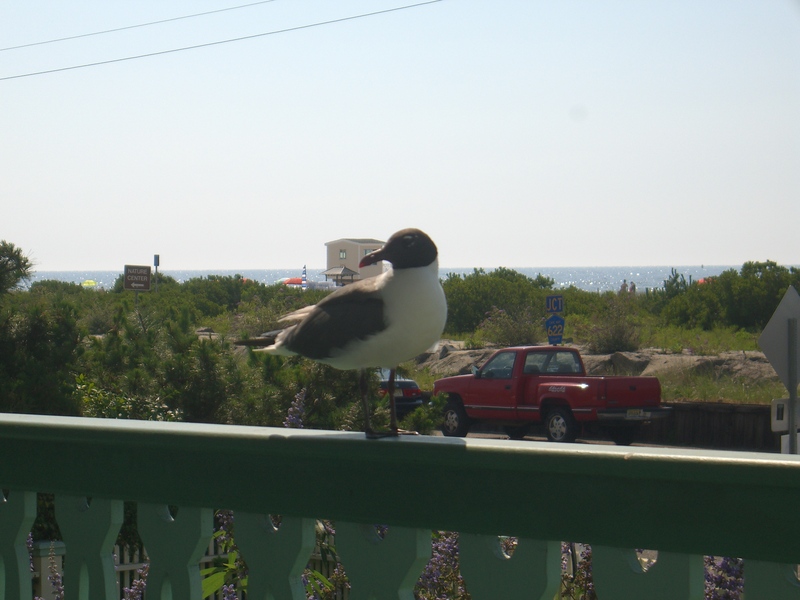 Turning the pages with damp, salty fingers goes with the caress of the breeze on bare skin, sand between the toes, and the sound of the surf and laughing gulls. I read three books last week and enjoyed each one. Now I’m addicted to days (and nights) devoted to reading. I’ll wean myself with internet research. I tasted an amazing cocktail last week. I must learn how to make it. Then I’ll have something new to drink with the next book I read. 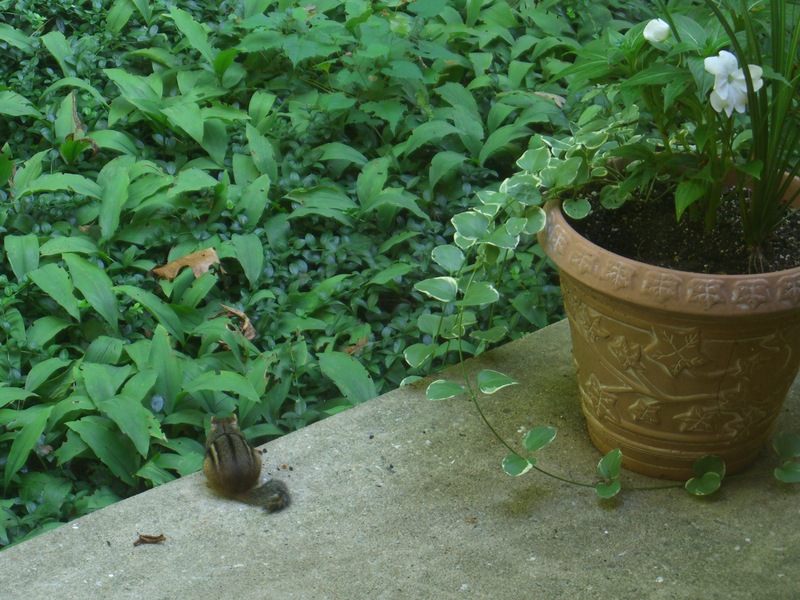 I don't have a picture of a squirrel, but chipmunks are equally annoying woodland rodents. At 8 a.m. on a school day, this disabled French teacher sits in bed, surrounded by fluffed pillows, sipping from an enormous Parisian coffee bowl, and pondering an early morning dream in which a school colleague was driving a group of teachers in our old dilapidated ’91 minivan (the one that literally limped its way to the junk yard and died in a cloud of smoke) down Frederick Road in Catonsville which turned into Atlantic Avenue in Margate, New Jersey. There was more to the dream, but I have hopes of actually holding onto my job, so I will stop there. The sound track to this little scenario is the pitter-patter of little feet. Our resident kindergartner has not yet gone to school. Pitter-patter. Pitter-patter. Thump, thump, thump. The sound is coming in stereo. Above me, in the attic, I hear the pitter-patter thumping of a squirrel. Below me, in the foyer, is the pitter-patter thumping of a little boy. They run in the exact same rhythm. The boy has the same energy as the squirrel. The only difference is that the boy is also singing, “This old man, he had five, he played knick-knack on my hive, with a knick-knack paddy-whack, give a dog a bone, this old man came rolling home.” Over and over again. It’s stuck in my head…and now it’s stuck in yours. I pray for Harper’s teacher. I hide in my room until every last person, husband included, has left the house. Some of you may be thinking that I’m going squirrelly being home on disability for weeks and weeks. Those who really know me will understand that I’m going squirrelly because there’s always someone coming or going around here! I’m currently reading the book Quiet by Susan Cain. It’s about introverts in an extroverted society. For an introvert, there is nothing earth-shattering in what she has to say. It’s just nice to have a book that validates what we know to be true. Introverts need time and quiet to think. Thinking is needed in our loud society. Introverts are needed in our society. Our society does not value introverts. Not all societies extol the extrovert model, which has implications for internationals in our country. Introverts communicate better through writing than speaking. Introverted teachers act out a role in class, a role which leaves them exhausted at the end of the day. For the moment, I am alone in a quiet house, thinking. The sun beams in my window. Outside, the world whooshes by on the highway. I’m now ready to tackle the to-do list.